So after defeating the a soulstealer and sort of coming to terms with being a bean sidhe (banshee), Kaylee can't seem to get a rest. When she thinks she's having a nice night out with her boyfriend Nash, the teen pop idol they've come to see in concert dies on stage. And Kaylee doesn't feel the urge to sing for her soul, because said teen pop idol literally sold it in turn for fame and fortune. People should really learn to read the fine print BEFORE they sign a contract. When you sell you soul to a hellion, upon your death your soul is his and you are in fact his to do with as he or she pleases for all eternity. Which means torture in most cases, since hellions aren't exactly known for their pleasant conversation, kissing babies and such. Nash and Kaylee can't help the dead pop idol anymore, but they discover an old acquaintance of Nash and Tod has done the very same and she's scheduled to die within the week. So they set out to try and save her soul before it's too late. 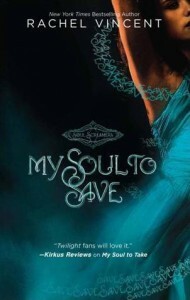 I really enjoyed the sequel to My Soul to Take. Kaylee seems to come more into her own and is a bit less confused by everything bean sidhe related. Her dad has come to stay and she's living with him, they're trying to work things out together, though it's not always easy. They don't always agree on curfew, boyfriends, dangerous escapades.. And he can't really argue against: "You haven't been around for the last 13 years and now you want to tell me what I can and can't do??" Nash still suffers from hero-complex, but he manages to be a likeable character even though he does need to lighten up some. We also get to see more of his brother Tod, who I like more and more as a character. Tod doesn't always do the nice-guy thing and he makes no excuses for being the way he is. He does seem to care for his family and develops a friendship with Kaylee. He's a really interesting character. I liked how we're shown more of Kaylee's world and of the Netherworld and the beings that dwell there. I thought the concept of selling your soul was really interesting and I think it was executed very well. The story again spans a couple of days, and the action at the end had me turning pages like I couldn't stop. Oh, and the person who designed the covers for the series is a genius, I LOVE them! It's probably the color and the dresses, I am such a sucker for ballgowns.